After their reign for the last 2 years in University Athletic Association of the Philippines (UAAP) in Womens’s Volleyball, the Ateneo Lady Eagles fell short against their longtime rivals, the La Salle Lady Spikers on Game 3 last April 30 held at the jam packed Araneta Coliseum with scores 19-25, 25-21, 25-16, 25-16. The Lady Eagles were swept by the Lady Spikers on Game 1 but Alyssa and her teammates didn’t lose hope and they eventually won Game 2. At the deciding Game 3, the players together with their supporters were hyped and nervous. The Lady Eagles won the 1st set but the Lady Spikers recovered and won the next 3 sets but for Alyssa Valdez who is known for her monicker “phenom”, it is not the end for the lady eagles. At the post game press conference, teary eyed Valdez told the media that life goes on. 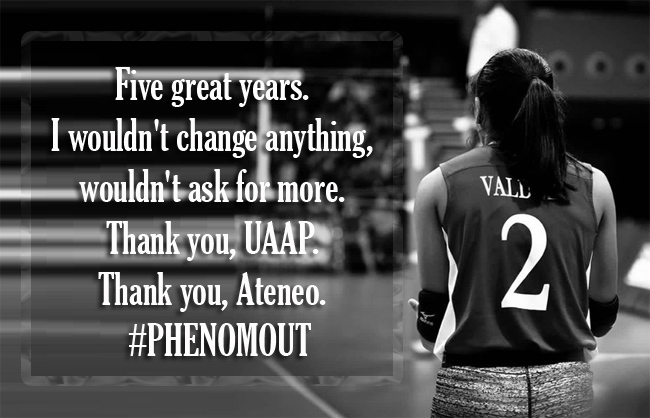 She added that she was grateful that their team reached the finals and they never expect to be no. 1 after the eliminations. She also praised and congratulate the lady spikers and revealed that they are a better team. After her collegiate career, Valdez is looking for bigger challenges after her successful stint with the lady eagles for the past 5 years. She was also thankful to Ateneo and admitted that she discovered herself on her alma matter and this loss is one of the best challenges that she encountered. Alyssa originally was from UST and she was hesitant to leave the university for Ateneo to play volleyball but Valdez didn’t regret anything. After the game, Valdez was applauded by the Ateneo Community and La Salle Supporters for her contribution to Volleyball. She is one of the reasons why Volleyball became famous to our country’s basketball fanatics. She was also praised by her team mates and friends in Lady Spikers like Ara Galang.